I have heard this phrase a few times over my coaching career. It is all the more pleasing and harmonic when it is preceded by a totally opposite phrase. That is how it often starts out. 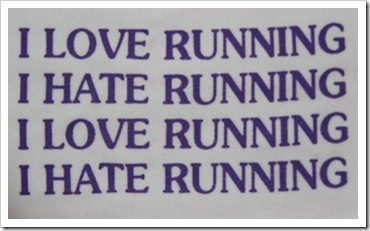 Some people don’t like to run. They say that it is not an enjoyable activity. It causes them stress, grief, undue discomfort and nightmares. They tell me how they can’t make it 2-3 minutes before they have to stop and walk. They tell me how it hurts their knees and ankles. They tell me how they can’t even comprehend how someone could run a full 5K let alone a marathon. They tell me that they only run if someone or something (zombie, dog, mountain lion) is chasing them. They tell me how they don’t like to sweat, make themselves uncomfortable, breath heavy or work hard unless there is a paycheck associated with it. My standard response to that is that they are going too fast. “But, Doug”, they say, “if I go any slower, I’ll be walking.” Then, walk, I say. The conversation follows a predictable flow. They say that if they walk, it will be a waste of time because they heard from their parents and coaches and friends things like anything worth doing is worth doing well, no pain – no gain and if you are going to accomplish anything in life, you need to push yourself and live up to your potential. My standard response to that is how is that working for you. I then talk about the “no pain – no gain” myth as it relates to endurance sports. They don’t believe me. I tell them about how the body taps into different energy sources depending on their intensity level and that they need to stop driving the flashy and powerful Ford Mustang muscle car kind of energy system so much and start driving the understated and reasonable Toyota Prius hybrid car kind of an energy system much, much more. I tell them to go for a run as slow as they think is possible and if they still start to breath heavy to walk. I tell them that they need to work on mobility at first as much as they do exercising. I tell them that the best workout in the world is actually the worst workout in the world if it makes to too sore, too tired, too unmotivated or too injured to make it out the door to your next workout. Every few weeks I tell them that they will need to exercise less and take a break. I tell them that sleeping in is sometimes the best workout that you can do. I tell them that gaining fitness is like aging a fine wine that it takes time and patients. After all of that information washes over them, many of them say that no one has ever told them that they need to slow down or to not push themselves. They say that no one has ever called sleep an important part of working out.